This article is about the act of steeping. For the medieval coin, see steeping (coin). Steeping is the soaking in liquid (usually water) of a solid so as to extract flavours or to soften it. 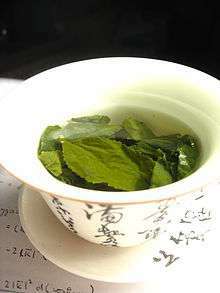 The specific process of teas being prepared for drinking by leaving the leaves in heated water to release the flavour and nutrients is known as stewing. Herbal teas may be prepared by decoction, infusion, or maceration. Some solids are soaked to remove an ingredient, such as salt from smoked ham or salted cod, where the solute is not the desired product. Dried teas as loose tea or tea bags are prepared for drinking by steeping the leaves in just boiled or heated water to release the flavour and nutrients in the dried tea into the water. This is often done in a cup, mug, teapot, pitcher or urn. A tea infuser or a tea strainer may be used to assist in this process. Steeping grain is a part of beer making. ↑ "Corn steeping". www.Corn.org. Archived from the original on June 13, 2005. Retrieved June 20, 2005.